Peter MillsEach of these brightly-coloured board books from Hunt and Thorpe has a special window for your children to peek through! 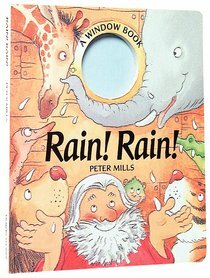 Toddlers and preschoolers will be enthralled by Peter Mills delightful retelling of four popular Bible stories. 12 pages each, from Hunt and Thorpe. About "Rain! Rain! (Window Book Series)"
Window books open new light on favourite Bible stories. Each book has a window feature which leads children through the book to its happy ending.